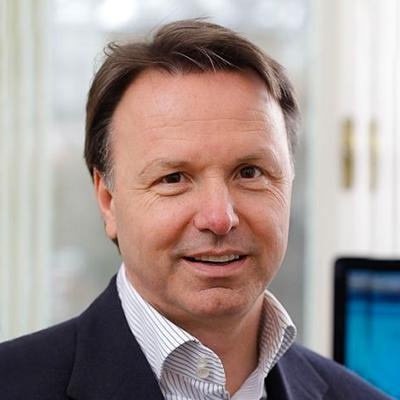 White Paper: The Salespreneur by Nikolaus Kimla - SalesPOP! What a salesperson must be to survive in the 21st century? 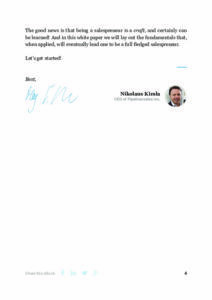 In this white paper, Nikolaus Kimla answers that question fully. 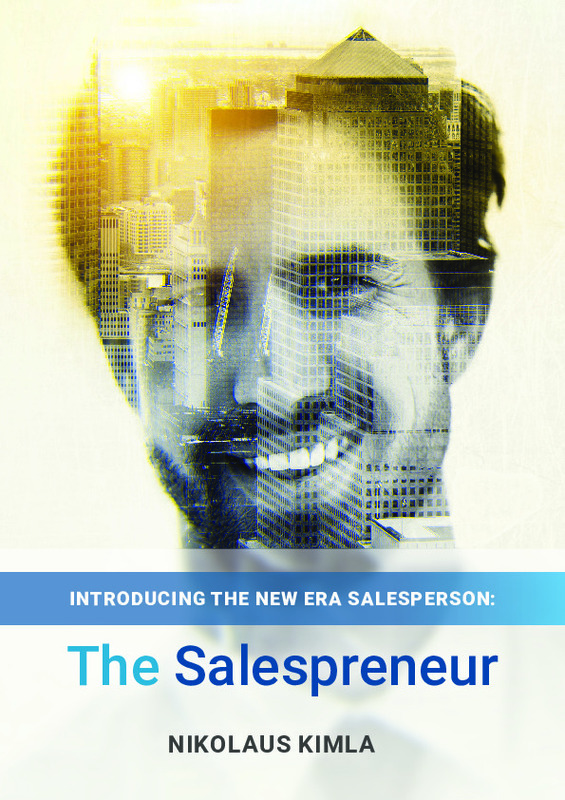 This persona could be called the New Era Salesperson. They could be referred to as the Entrepreneur Within The Enterprise. But neither of these precisely expresses what we mean, and so a few years ago Nikolaus coined a new term: salespreneur. There is a clear difference between the traditional salesperson and the salespreneur—there are many qualities that a salesperson must take on in order to become a salespreneur. 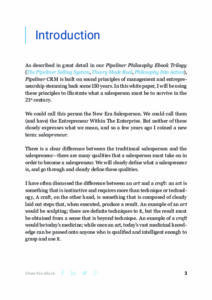 In this white paper, a salespreneur is clearly defined, and the salespreneur’s qualities are fully described. Some examples of these qualities: there is a considerable difference between the salespreneur and an average company worker. A salespreneur has a notably higher level of dedication than the normal employee. A salespreneur adopts and makes the absolute most out of available technology. Nikolaus has often pointed out the difference between an art and a craft. An art is something that is instinctive and requires more than technique or technology, A craft, on the other hand, is something that is composed of clearly laid out steps that, when executed, produce a result. An example of an art would be sculpting; there are definite techniques to it, but the result must be obtained from a sense that is beyond technique. An example of a craft would be today’s medicine; while once an art, today’s vast medicinal knowledge can be passed onto anyone who is qualified and intelligent enough to grasp and use it. 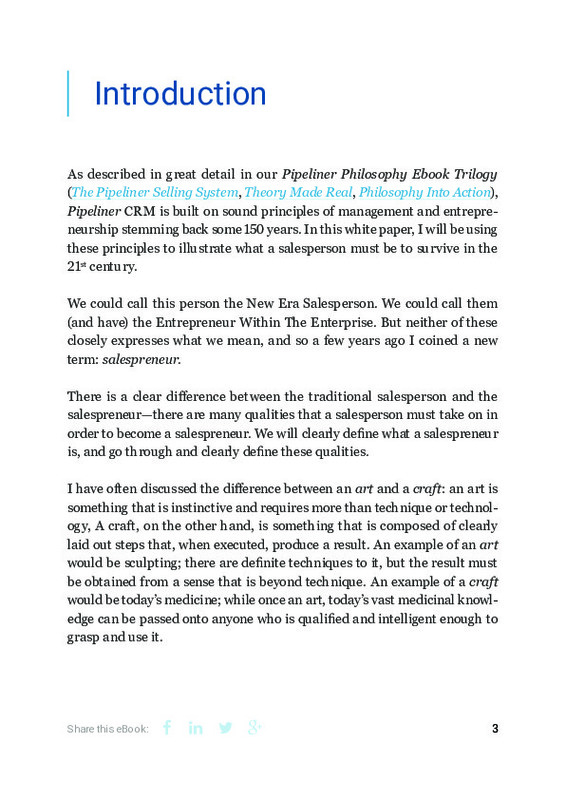 The good news is that being a salespreneur is a craft, and certainly can be learned! 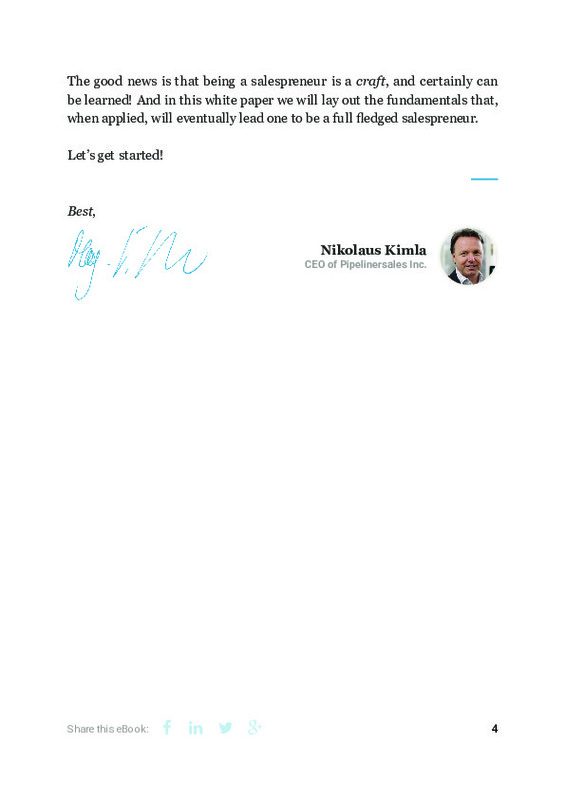 And in this white paper Nikolaus lays out the fundamentals that, when applied, will eventually lead one to be a full fledged salespreneur. A true salespreneur has the above kind of dedication and belief, and they’re succeeding because they’re getting the job done. They don’t view themselves as mere employees, but as totally in charge of their careers and their lives. They’re willing to take the necessary risk to achieve the reward, because they feel they can and win. 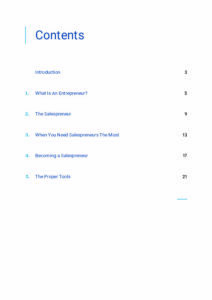 Chapter 1: What Is An Entrepreneur? 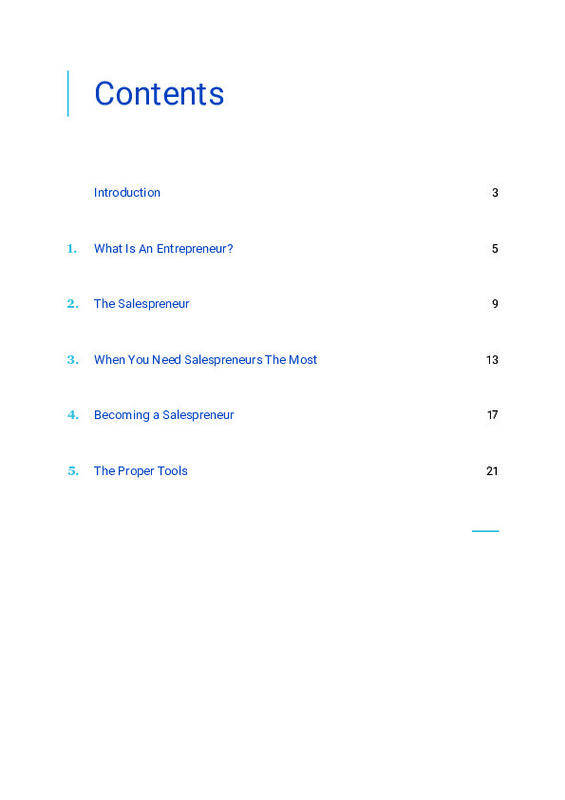 Before we can explain the salespreneur, one must first fully understand the concept of the entrepreneur on which it is based. In various schools of economic thought, the entrepreneur is assigned a crucial role in economic development. The entrepreneur is one who seeks out information that can be utilized for profit, and continuously finds creative ways to do so. A true salespreneur has real dedication and belief, and they’re succeeding because they’re getting the job done. They don’t view themselves as mere employees, but as totally in charge of their careers and their lives. They’re willing to take the necessary risk to achieve the reward, because they feel they can and win. It is especially important when a company is just starting up and/or a new product is being launched that salespreneurs be employed—as well as why they should be employed. A salespreneur has the right “pioneer spirit” to go out and obtain their own leads when needed, to go the extra mile in bringing in a new opportunity, and to literally perform any function necessary to make new customers and keep them happy. The first qualification, and the first thing the aspiring salespreneur will need, is a willingness to learn. This might seem like a “no-brainer”—but without such a willingness, a person will not make it any further than they are now. You totally adapt a willingness to learn, so that you can, and you aim for—and begin achieving—the stars. The sales process, sales pipeline, tasks and activities and other tools provided through the War Room are those that make it possible for the salespreneur to operate at maximum speed and optimum efficiency. In other words, they make it possible for them to be a salespreneur. 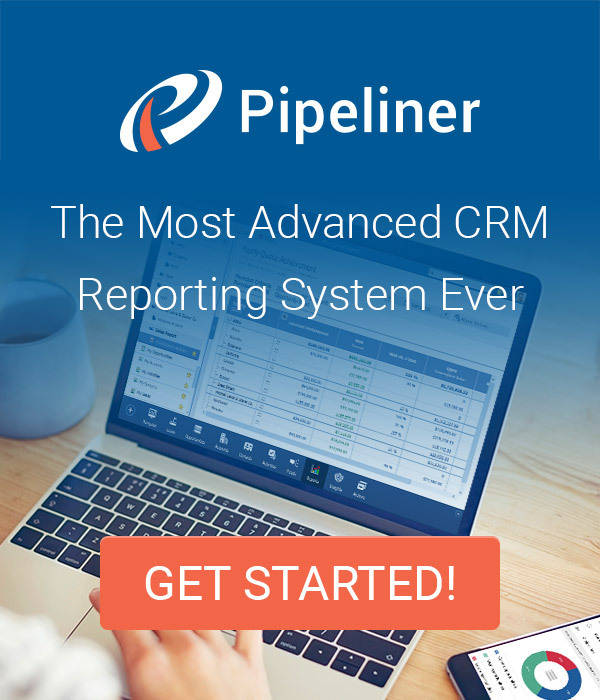 Pingback Synergizing HR and Sales for Better Sales Effectiveness - SalesPOP!